Fatgirl Hedonist: Snail of Approval! 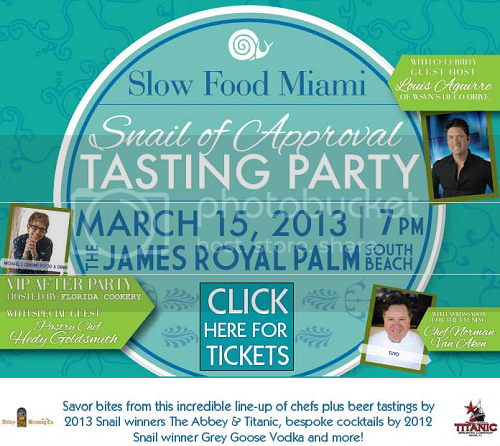 Slow Food Miami is the local chapter of Slow Food USA, is having its 2nd annual “Snail of Approval” Tasting Party on Friday, March 15, 2013, from 7 to 10 p.m., at The James Royal Palm (1545 Collins Avenue, Miami Beach). Slow Food Miami is a non-profit organization that supports good, clean and fair food for all. Chef Norman Van Aken and Deco Drive's very own Louis Aguirre will be hosting the event. Tickets are a little on the pricey side with Main event tickets costing $85 and limited VIP tickets at $165 per person. Keep in mind this is all for charity with all event proceeds benefiting Slow Food Miami’s Edible Garden Program. Some of the restaurants that will be cooking up delicious food at the party include The Dutch, Eating House, Edge Steak & Bar, Essensia, The Federal, Harry's Pizzeria, HaVen Gastro-Lounge, Lido, LoKal and many more. We all know it ain't a good party without some boozey libations; attendees can sip on some garden-to-glass cocktails courtesy of Grey Goose Vodka, specialty wines provided by Vinecraft and for the DD's at the party non-alcoholic refreshments from Whole Foods Market SoBe will also be available. Just like with any good party, the VIP After Party is happening from 9:30pm to Midnight at Florida Cookery with treats from Hedy Goldsmith. The After Party will honor 2014 nominees Kris Wessel of Florida Cookery and Matt Hinckley of Boxpark.